As you know, I typically interview members from the wool industry on my Wool Academy Podcast. Klaus Steger and I also recorded our interview with the podcast in mind. However, technology let us down that day leading to a bad audio quality that sounded as if heavy monsoon was coming down in the background. So instead of listening to our talk, you can now read the full interview in this blog post. Enjoy! Klaus Steger is the CEO of the Erwo Holding AG. The major activities of the Erwo Holding AG are The Südwolle Group and the Hoftex Group. The Südwolle Group is the leading global producer of worsted yarns in pure wool and wool blends. Klaus Steger also serves as a board member of the Executive Committee of the International Wool Textile Organisation. Elisabeth van Delden: Please introduce the Südwolle Group to us. Klaus Steger: The Südwolle group started in 1966. Of course, during these 50 years, many things have changed and we started off as a spinner for pure wool and only white weaving yarns. Today, we are a producer of a huge variety of different yarns. Wool and wool blends are still important but there are also many developments happening with synthetic fibres and animal fibres and other things. We produce coloured yarns by operating three die houses in Germany, in Italy and China. In addition, we also treat our wool tops to make total easy care treatments possible. We have additionally invested in eco-friendly methods of treating wool tops to make them washable like plasma and other non-chlorine methods. We have developed this area quite a bit over the last years. The Südwolle Group is active in various countries. We produce in Poland, Bulgaria and Romania and in China. we are currently also investing in Vietnam. The Südwolle Group employs about 3200 people. I myself started working for Südwolle as a family company in 1985. Since 1990, I am in a responsible position and I still enjoy it very much. Elisabeth van Delden: Who would be your typical customer for your products? Please also explain what type of products your yarns go into? Klaus Steger: The typical customer of the Südwolle Group doesn’t really exist anymore. We are selling in all segments of the garment industry. We are selling in the segments of the weaving yarns of course, where the traditional market was and into the flat knitting markets for sweaters. We are selling in the circular knitting market for outdoor and active garments. We are selling in the seamless markets for next to skin. We are also selling in the non-apparel market which is for example aircraft seating, car seats, upholstering, work wear, which is also apparel but we approach it differently in our company. We are selling in all kinds of markets which use wool yarns and wool blend yarns for their products. High fashion as well as technical appliances. Klaus Steger: …or on long-haul flights which is typically a blend of wool and fire retardant polyester. Elisabeth van Delden: Can you tell us a little bit about the history of the Südwolle Group and mention some of the key milestones along the way? Klaus Steger: I mentioned before that the whole story started in 1966. The first production in 1972 was, of course, a milestone by my father and my uncle. And then for many years, we grew in producing pure wool yarns for weaving. This was a big period of standardisation and my father and my uncle they developed just-in-time deliveries for the garment industry. Then with the fall of the Berlin Wall in 1990, we suddenly had tremendous competition from Eastern Europe. That is when we had to reinvent the company. My cousin and I who were the young people in the company at the time went out to Eastern Europe and very quickly developed a company in East Germany, later also in Poland. We didn’t stop there we went further to China. As I already mentioned my first trip to China was in 1991 and we started production in 1995 in China. That was another big milestone. We shifted all the production from Germany and Switzerland into Poland and China. Later on, we acquired companies in Romania and Bulgaria. The next big milestone was in the beginning of the century when we decided to leave the realm of weaving yarns and ventured into knitwear. That was a tremendous step and today we are doing much more quantities in knitwear than in weaving. So this was a very important move. Then a couple of years later after being active in the knitwear market, we noticed that it is important to have competence in colour so we built our own die house first in China and later we acquired one in Germany. Later on, we acquired another die house in Italy. This was a very important milestone to acquire competence and know-how in colour. Another thing that happened recently was to become much more customer focused. We started to develop supply chains with customers who are willing to invest into this idea and to profit from this development as well. We started a program that is called ‘Fit for purpose’, meaning that we try to develop the right yarn for exactly the right purpose. So at the moment, we live in the era of customisation for our end users. Elisabeth van Delden: Those are very interesting milestones. We can see the whole history of what happened in the textile industry in Europe also reflected in Südwolle’s history and that you always had to adapt to what was happening in the market. Klaus Steger: Yes, that is true. Elisabeth van Delden: Now I would like to go back to one of your first milestones which was China. Tell us a little bit about that adventure. You said that you went for the first time to China in 1991 and you started your plant in 1995. Please tell us what it was like to start a business in China over 20 years ago and what has changed since then? Klaus Steger: in 1991 it was pioneering work for us. Of course, I was much younger and everything was an adventure. It was really exciting and we mustn’t forget that I had a stable company in the background. That of course gave a great feeling of security when we started there. In the beginning, I wasn’t sure if we should go to China or to India. It took me a year to decide to go to China because I actually found it easier to work with Chinese business expertise than with other cultures. Chinese people are straightforward so it is very easy to deal with the Chinese. I haven’t been disappointed since then and it was always a very cooperative feeling. Also, the authorities gave you the feeling that you are welcomed. They want you to invest in this country and this was very assuring and that hasn’t changed since. Today we are operating six plants in China and we employ about 1600 people in the vicinity of Shanghai. In the beginning, it was easier in the sense that the people were following you as the investor. Things were not questioned. In the meantime 20 years later, the self-confidence of the Chinese people, luckily I must say, has improved immensely, so that there is a positive exchange and cooperative spirit between Chinese and foreign colleagues, based on mutual respect and trust. Today you get a lot of positive input from the Chinese people and from your Chinese employees. That is the biggest change, the development of the Chinese employees’ force is tremendous. Elisabeth van Delden: From looking at what you publish on your website, sustainability is also an important topic for the Südwolle Group. I would think this is also an area that you saw changing a lot as well in China. Klaus Steger: Yes, sure. We in Europe had the same development just some years earlier. I remember as a boy not being able to swim in the river anymore. Suddenly it was forbidden. Now 40 years later I read in the newspapers that the rivers around Nürnberg are cleared for swimming again. The same thing that happened here in Europe is taking place in China but in a much faster way. We should not look at China and say that they are not doing anything for the environment. It is just that they are developing this huge country. And the importance of environmental policies is now absolutely evident and they are doing a lot. It will take time. For new investments, the regulations are to my knowledge sometimes even tougher than in Europe. Elisabeth van Delden: Earlier you were talking about ‘Fit for purpose’. You are also exhibiting at fairs such as ISPO which is not a yarn fair but a sports and outdoor fair. What is the strategy behind being present at these kinds of fairs? Is it related to your strategy of ‘Fit for purpose’ and working more closely with your customers? Klaus Steger: It is certainly supplementary. Our yarns go into garments or some kind of other end product. It is interesting for us to be present at shows where the end product is being presented and sold to retail. It has developed in such a way that the brands who are exhibiting at these fairs, they have questions. Also, their customers come to their stand and they have questions about their raw material. They have new ideas, they want to exchange their ideas very quickly. So they come to our booth and we can discuss and take the input directly. It has developed into a very good tool to be present at these shows where at the end the product is being sold in which our material is being used. It is a very tight and fast information flow. Elisabeth van Delden: Yes, nowadays you have to react very quickly as the fashion cycle has become faster and faster, therefore you need to be able to communicate quickly with your customers. You also do a lot of innovations and have been awarded an award a couple of years ago. Tell us what kind of innovations you have developed recently? Klaus Steger: Everybody in the industry knows the permanent pressure to show something new. Several times per year, people come to see you at fairs and exhibitions asking you what new products you have. In the end, the quantity of new products that you sell is small but it shows your competencies. It shows that you live in the market and that you develop the market. So, yes, innovations are important. The next question is how do you define innovations? Is it just the level of yarns, is it just a different number of turns, a new colour, a different number of micron? I don’t think these kind of things are innovations. Innovations for us are particular developments for specific needs of the customer. For that we have founded a new department in our company, it is called Südwebs in which we bring in all these activities and new ideas to develop particular products. Either in general or of course protected products for specific customers. Elisabeth van Delden: And the innovation that you got an award for? Klaus Steger: That was Plasma development. Plasma is actually a technology we inherited when we took over the Stöhr company seven years ago. There was a machine and the technology was there but it didn’t really work. So we put a lot of effort, money and time into it to make this technology work and to make it work on a reliable basis. Plasma is a technology to make wool washable without using chlorine. It works with plasma and is a physical process that happens on the surface of the fibre with ionisation. The motivation behind this innovation is to replace the Chorine-Hercosett system that makes wool washable. Chlorine-Hercosett is under ecological attack. Therefore there are efforts for using non-chlorine methods for making wool washable. By washable we mean machine washable. Plasma is the perfect treatment for easy care performance apparel. Elisabeth van Delden: Speaking of Südwebs – can you share a few trends that you see happening in the wool industry? Klaus Steger: One trend that is happening at the moment is that the relations between fashion and outdoor sports is growing. There has been a tremendous success in the outdoor fashion industry to move from the extreme garments which you wear just for climbing and skiing to move more into the fashion area where you wear clothes which are suitable for outdoor activities but also for the highstreets. Vice versa fashion brands take ideas from the outdoor world. This has been happening over the last few years. So when we break this down to what is the meaning for us? The need for different yarn compositions, different blends comes out of this. The advantages of wool coupled with the advantages of some other fibres, also man-made fibres in the outdoor, sports and fashion sector. There are of course many, many possibilities. Elisabeth van Delden: How do you see the suit market developing in the future. Klaus Steger: The suit market, which has been the traditional market for wool, has been declining over the last 20 to 25 years. People don’t wear formal clothes anymore, it has become less and less and it continues to become less and less. The suit will, of course, be around for many years to come, but the quantity of suits being sold on a worldwide scale is declining. It is not only the menswear where the wool has lost, it is also the womenswear. It is much more drastic in the formal womenswear and the day to day womenswear in the weaving sector. In the knitwear sector, it is the contrary development. Knitwear is at the moment still a very big component and it looks like it is continuing to stay around. Elisabeth van Delden: You also own a sheep farm in Australia. Is this also important to the work that you do, that you have this close connection to the source? Klaus Steger: Yes definitely. The sheep farm’s name is Mount Hesse. It is a very good Marketing tool for our company. We can prove that we know what we are talking about. We know how sheep need to be treated. We know about the welfare, we know about the quality of the wool, we know what is important for breeding sheep and we have the knowledge about the source of our material. And this is very important. Of course, the sheep farm is also a very nice place to be. So close to nature and we are managing this farm on a sustainable level. It is a very interesting exercise. Financially it is a very small part of our business but culture wise it is quite a good ingredient to our business. Elisabeth van Delden: You are also a member of the Executive Committee of the International Wool Textile Organisation. You have served as a Board Member for quite a few years now. Why do you think it is important to engage yourself or to engage as a company within the industry? Klaus Steger: That is not so easy to answer. There are various reasons. One reason, to be frank, is of course to be part of that wool world and to also take part in the information pool. This is something which is very important. The second reason is that the industry works along with certain rules and guidelines. IWTO is the body where these rules and guidelines for this industry are shaped and developed. To be there where these rules are made, to have the information and the opportunity to influence the shaping of the rules is another argument and of course you can do this only if you are present. Thirdly, and most importantly, I think it is important to show the wool world that there is a body that takes up the interests of the people working with wool and making a living out of wool. This is in my eyes the most important reason. Many people don’t recognise this but I think there is an important number of people who do recognise that it is a good symbolic act to have a unified voice for wool. It is not easy, it is a lot of political work which is never easy, but that is the goal behind it and I think this is a very worthwhile exercise to engage in. Elisabeth van Delden: I think it is important to note that you are a very busy leader of a huge company, but still you take the time to invest in the general good of the industry. The more people we have like you do this the better it will be for everyone. Now before we end our interview I would like to ask a more personal question. You get to travel a lot and you get to see many places and meet many different people. What is your favourite moment or adventure you had while working in the wool industry? Klaus Steger: There has been many wonderful occasions and events. Of course, you tend to remember only the successes. The 20 years celebration in China as well as our 50 year celebration in 2016 certainly was something very spectacular. These highlights are unforgettable. I have of course many anecdotes of our beginnings in China when we were looking for our first employees in China and the experiences we had there. I cannot pick one event that is most remarkable. But one thing, people who are working in wool in general, there are some exceptions probably, but in general I have met the most sympathetic, and straight forward and hard working people in this industry. Elisabeth van Delden: So you like the very passionate people working in the wool industry? 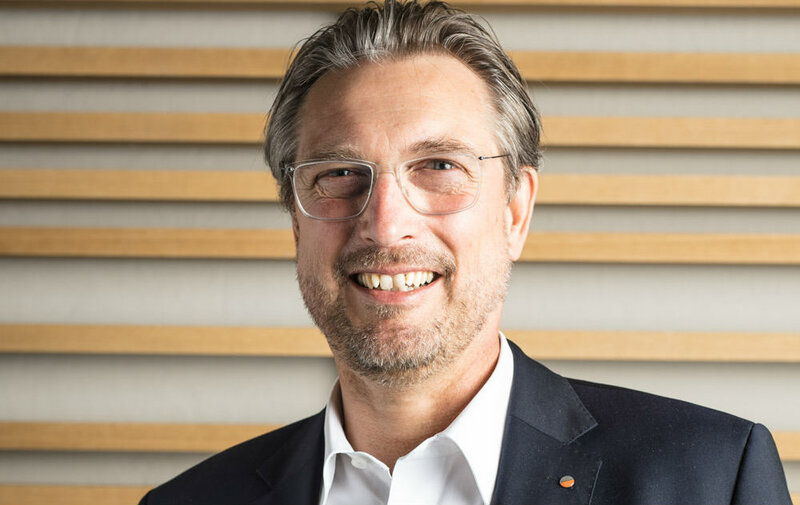 Klaus Steger: Yes, exactly, passion is something that you need to work with wool and it is also one of the key strategic words within our company. Elisabeth van Delden: Passion is a good word to end our interview. Before we end, where can our readers find out more about the Südwolle Group?